The term "cutting" a cabochon is really a misnomer, cabochons are not cut in the strict sense of the word, rather they are shaped and polished using a grinding process. 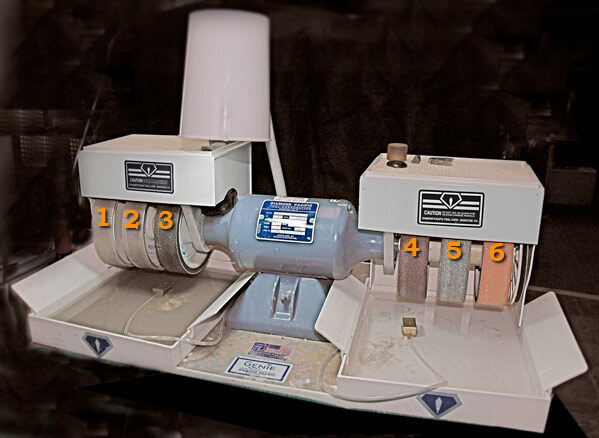 The mechanical grinder shown below is called Genie and has 6 grinding wheels and a polishing disk and is used to create cabochons. 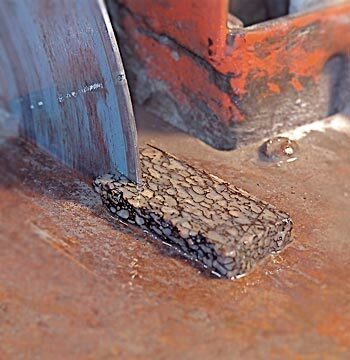 The first wheel (1) is a hard wheel (steel backed) and has a 80 grit wheel for fast stone removal and shaping, a (2) wheel that is also steel backed and 220 grit, used to remove the rough marks left by the first wheel and fine tune the final shape of the cab. Wheel (3) is a soft backed wheel with soft foam behind the grinding medium which makes it flexible and able to conform to the stones rounded shape. This helps remove any flat areas. This wheel is a 280 wheel but removes material really slowly compared to the hard wheel. It is used to provide a smooth finish on the stone and leaves a mat finished smooth stone when complete. Wheels (4-5-6) are pre-polish wheels and are used to remove fine scratches and yield a lightly polished stone when complete. Their grits are 600, 1200 and 3000. These are all soft-backed wheels and each will remove the fine scratches from the previous wheel but will not change the shape of the stone to any extent. There is spin-on disk that can be added to the right hand end-shaft and they can be covered with a polish for the stones final shinning. Tin oxide, cerium oxide, or other oxide powders are painted on the disk to obtain the final polish. These disks are covered with leather, or fine mesh fabric to aid n holding the polish. Notice that the wheels are located above trays of water, the metal blocks (brass) at the end of he tubes are small pumps. They flush water over the surface of all the wheels while they are in motion. Stones should not be ground in the dry state, although this may not be harmful to the stone, the wheels will wear out really fast with the heat generated. The water keeps the temperature down during the grinding process and aids in removal of the stone powder generated. Step 1 - select a material from which to make a cabochon. 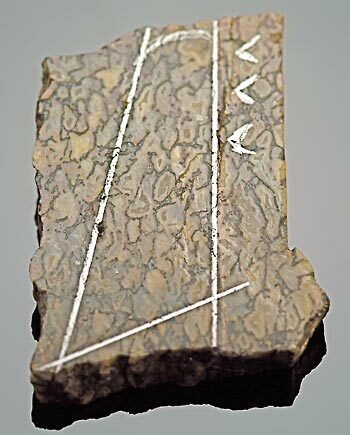 Use a slab of the material and mark out the desired shape using a pencil or aluminum scribe. Step 2 - using a diamond trim saw cut along the scribed lines to remove as much excess as possible without actually touching the lines. 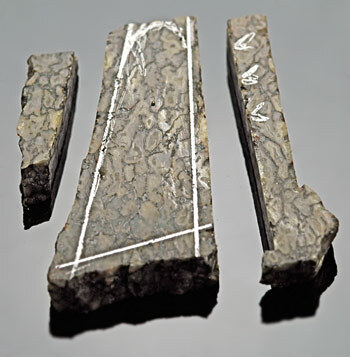 The slab as cut with the trim saw before the beginning of grinding.